Thanks to the sponsorship of our conservation partner, Aquarion, we have Eastern Hellbenders residing in Professor Beardsley’s Research Station. 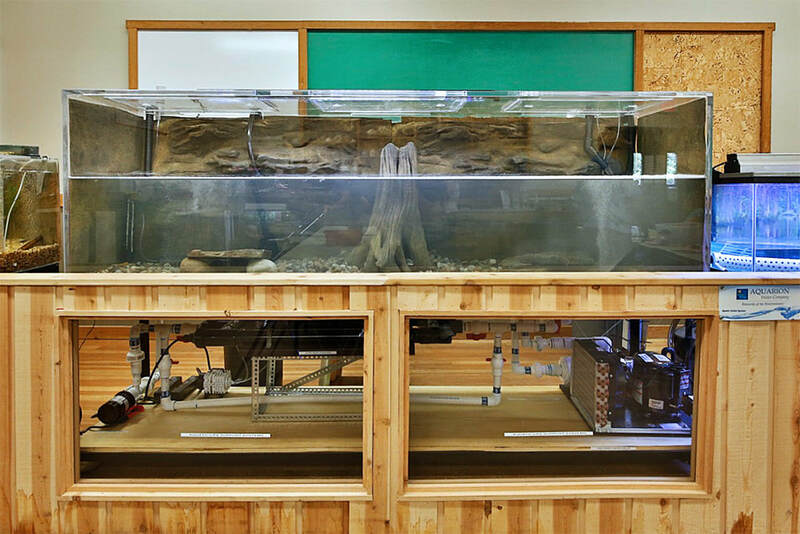 You can learn more about the Eastern Hellbender and our conservation efforts by observing the clean water sustainability system beneath the Eastern Hellbenders’ habitat. The Eastern Hellbender is a salamander and is the largest aquatic amphibian in the United States. They are not the most attractive amphibian and have been given lots of nicknames such as “snot otter”, devil dogs” and, “Allegheny alligators”. Eastern Hellbenders are fully aquatic amphibians that breathe entirely through their skin. That means they need clean, cold, oxygen-rich freshwater to live. 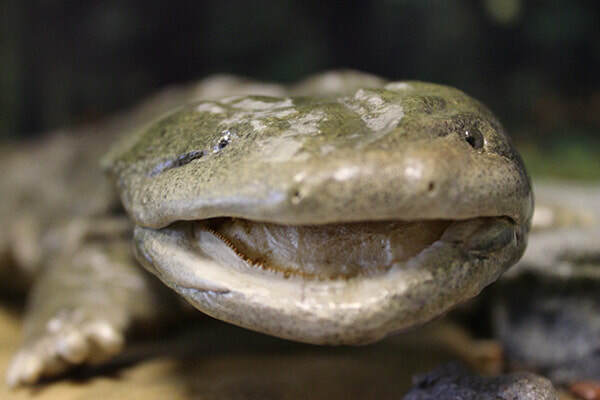 DESCRIPTION: The Eastern Hellbender grows to a length of up to 29 inches. They weigh between four and six and a half pounds. Their color varies from grayish brown to olive brown. Occasionally Eastern Hellbenders are all black. They will have a dark mottling over their back and sides. Eastern Hellbenders have a sleek flattened head and body that is well adapted to their environment of swift, flowing streams. They have short stout legs, small beady eyes and long tails like rudders. They have loose flaps of skins that run along their sides that serve a respiratory function. The larvae are about an inch long and they have gills for breathing. When they reach 2 years of age the gills disappear and they start breathing entirely through their skin by absorbing oxygen from water. They do not hibernate so they are active year round. They are mostly nocturnal and hide under logs or rock slabs in the water during daylight hours. RANGE: Eastern Hellbender’s North American range extends from southern New York to northeastern Mississippi, west to southern Illinois. HABITAT: Cold, fast flowing freshwater streams that contain large rocks or boulders for them to build dens under. DIET: Carnivores – crayfish, fish, tadpoles, frogs, water snakes and small invertebrates. FAMILY LIFE: Eastern Hellbender males dig out a nest to attract females. Females lay a double strand of eggs ranging from 100 to 500 in total. Once the eggs are laid the male chases the female away from the nest. The male then guards the nest until the eggs hatch approximately 70 days later. LIFE SPAN: In the wild Eastern Hellbenders live up to 30 years. In human care they can live as long as 50 years.